Hawks Aloft Blog /Hawks Aloft Inc.
As always, this year’s design was developed by world renowned quilter, and our executive director, Gail Garber. This particular piece was inspired by the many feathers collected during the summer months as our Avian Ambassadors molt. 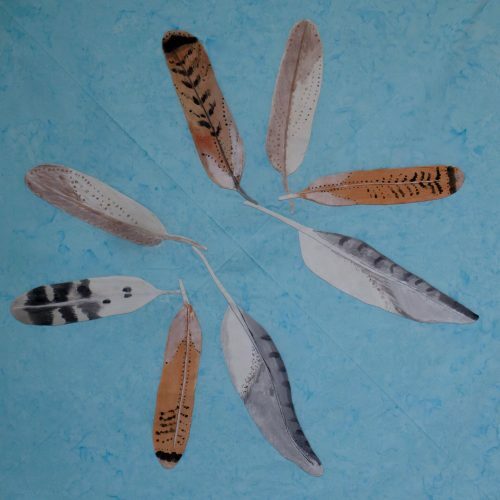 Incorporated into the design are the beautiful patterns of Swainson’s, Rough-legged, and Red-tailed Hawk feathers. Of course, this quilt isn’t made in a vacuum—it is, in fact, an extremely collaborative effort. Usually, a group of 12 or so convene at Gail’s cabin in the Jemez Mountains. This year, however, it wasn’t meant to be, with large amounts of snow accumulating in the mountains. 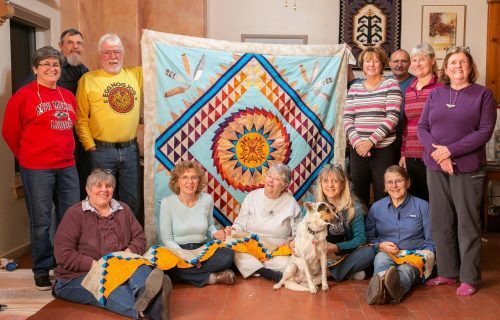 Instead, our intrepid quilters retired to the home of longtime friends of Hawks Aloft, Ed and Mary Chappelle in Corrales. 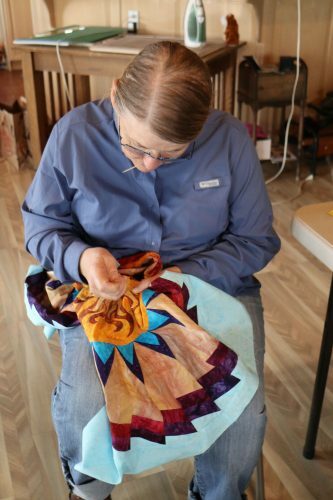 There, a team gathered in the dining area and worked over the course of two days to put the quilt together—though from design to finalization takes much longer. 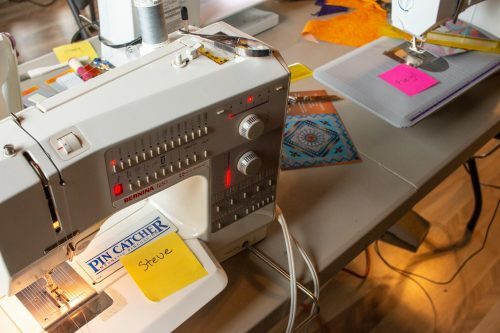 In addition to Ed and Mary Chappelle, other quilters came together, including: Ed and Barb Deshler, Carol Meincke, Cynthia Figueroa-McInteer, Sami Sanborn, Stevel Elkins, Evelyn McGarry, Lizzie Roberts, Allison Schacht, and Donna Barnitz. The quilt then went on to Tisha Cavanaugh to be completed. 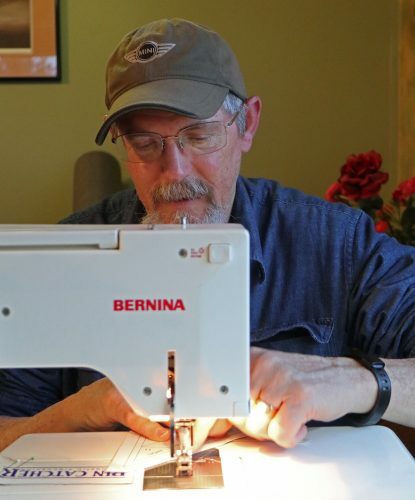 The quilt makes its live premiere every year at the Monte Vista Festival of the Cranes in Colorado, happening this year March 8-10. We sell raffle tickets for the quilt all year long, and put every dollar earned toward care for our Avian Ambassadors, education programs, research efforts, and rescue and rehabilitation. 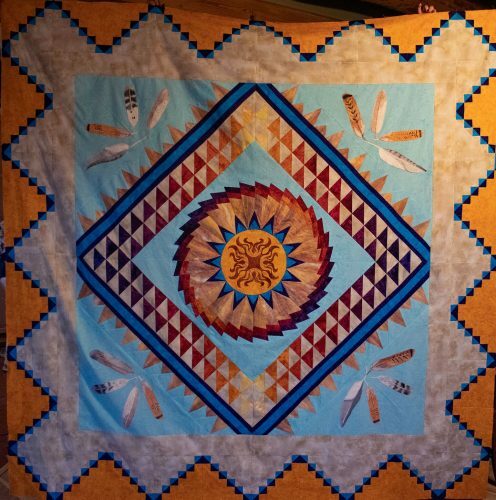 Take a look at some of the quilts made in past years here, and get your tickets here. Keep your fingers crossed until December, when we will draw a winner at our annual holiday party! And a nearly finished quilt emerged before the weekend was over! Just a few weeks we ago a new Avian Ambassador was permitted to us, trusted to our care and attention for the remainder of his life—the perfect holiday gift for all of us at Hawks Aloft. This isn’t just any bird, it is in fact an Elf Owl, the smallest species of owl in the world, although it tends to stay further south, in the western region of North America on either side of the Mexican border. 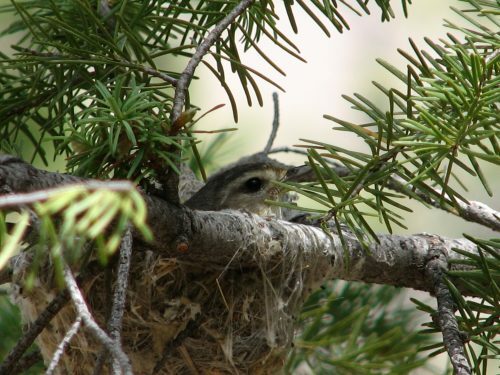 This petite, no-bigger-than-a-sparrow bird is quite scarce throughout most of New Mexico, so you can imagine our surprise at bringing this new friend into the Hawks Aloft fold. 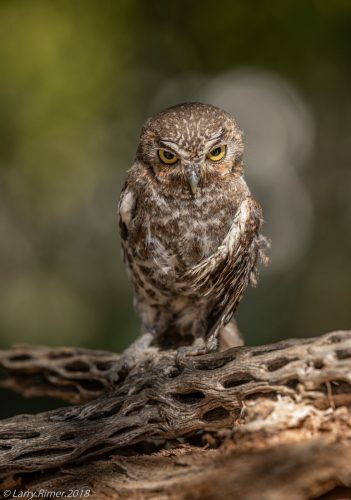 This owl—yet to be named, more on that soon—was found in Tularosa, New Mexico, a village slightly to the north of Alamogordo in the southern half of the state. 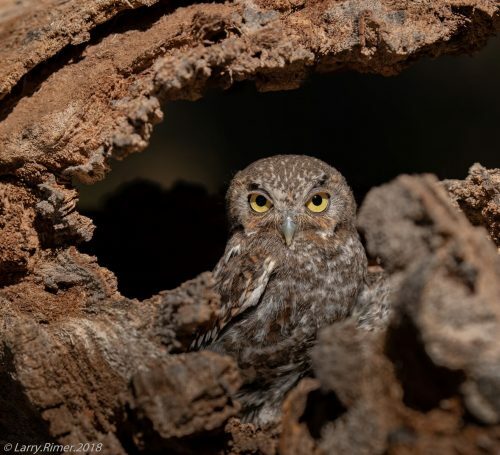 At any time of year, this is an unlikely spot for an Elf Owl to stake out—at the very, very northernmost tip of its range, and by some accounts, not within normal range for the species – period! 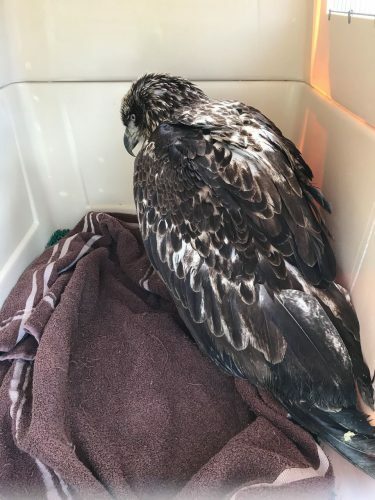 He was found with an injury and immediately transported to Alameda Park Zoo, where he was treated for a severe fracture to his left wing and for contusions throughout its whole structure. 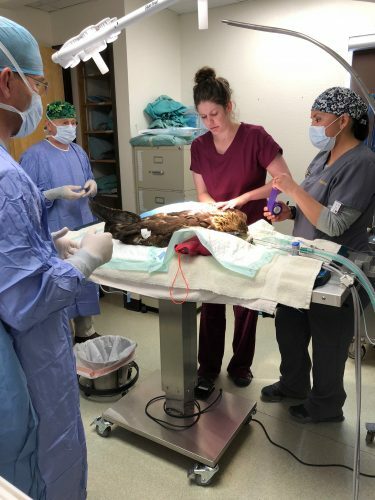 When the owl stabilized, he was transferred to us, where our own Lisa Morgan continued treatment along with Southwest Veterinary Medical Center’s Dr. Daniel Levenson. After many hours of treatment attempting to restore the bird’s flight, it become clear that full flight capabilities would sadly never be returned to him. This species is not just adorable, they are threatened throughout much of their range, and are federally listed as endangered in California. 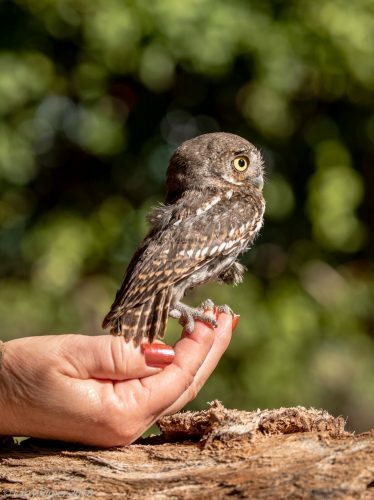 Thus, it’s all the more of an honor, then, to have this particular owl in our care, so that he might share his story far and wide and bring awareness to the plight of his species. All of Hawks Aloft’s Avian Ambassadors have names that are educational—they say something about each bird’s species, or their particular story. For example, Malary, one of our Prairie Falcons, was named this because of her lovely falcon malar stripes. Her pal, and our other Prairie Falcon in residence, Sunny, got this name because it says something about the kind of habitat the species favors. This month we are holding a contest to see who can name our newest Avian Ambassador. Got an idea? Email your best suggestions to Gail at gail[at]hawksaloft.org before December 31. In our January newsletter, the HAI Flier we’ll share a list of our top picks and will rely on you to cast a vote. (Not subscribed to the Flier? Sign up here!) We look forward to hearing your ideas, and in the coming months, stay attuned to upcoming Hawks Aloft events for your chance to meet our very own Elf in residence! The tables were all set, pictures were hung, food was simmering, aprons were strung near the picture windows, and Hawks Aloft staff and a few key members of our team of Avian Ambassadors anxiously awaited the first guests to walk through the doors of the Anderson-Abruzzo International Balloon Museum to kick off our Falcon Fiesta. 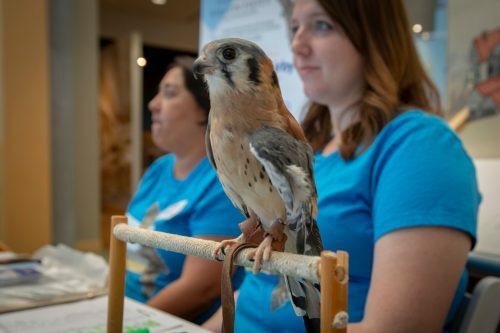 The Falcon Fiesta, which was held on Saturday, Sept. 15, was the second major event designed to raise money for our capital campaign–to break ground on the New Mexico Center for Birds of Prey. This center will house our Avian Ambassadors, provide a permanent site of rehabilitation for birds in need who come to Hawks Aloft through our Raptor Rescue Hotline, and a vital center for conservation education that will be, of course, open to the public. The center will be the first of its kind in New Mexico. The Falcon Fiesta in full swing! Months of planning came together for an evening of fun and celebration. 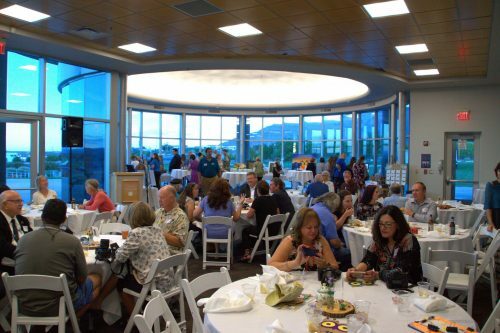 The Cooperage provided a buffet of fine foods, while numerous local business, creatives, and makers contributed to several tables of silent auction items. 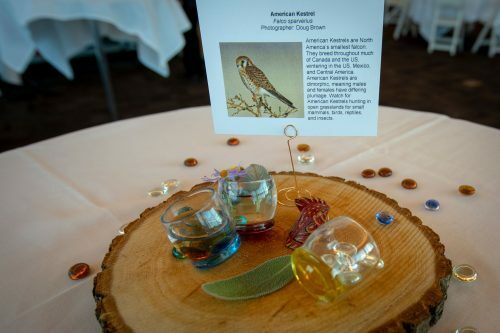 A handful of businesses generously enlisted as sponsors and a host of pros donated experiential birding trips, photography sessions, and one-of-a-kind pieces to our live auction, expertly run by our emcee, Dennis Chamberlain. Cake was served, the New Mexico Falconry Association brought their trained birds, and a caricaturist sketched pieces for attendees so they could always remember the night. The Falcon Fiesta wound down around 9pm, and tired staff and volunteers collapsed tables, loaded our cars, and headed home after seeing the success of an event that was in the works for many months. Everything we do at Hawks Aloft is a collaborative effort. We rely on our relationships with our dedicated volunteers, the mutual support between our nonprofit and local businesses, schools, and other organizations, as well as the investment of people who care about wild birds and their habitats. 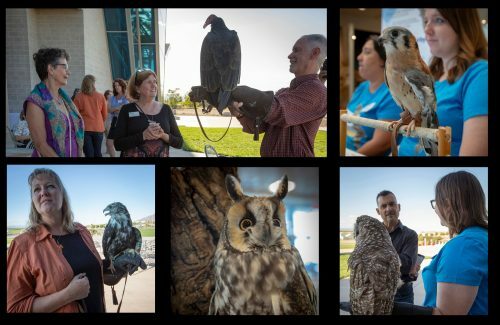 Thanks to all who helped make this event such a success–and keep an eye out for our next gala event to support the New Mexico Center for Birds of Prey! The first of the eagles came to us on March 16. 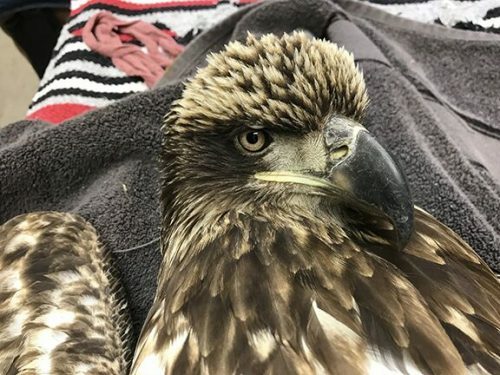 The bird–a juvenile Bald Eagle–had sustained a gunshot wound to the left wing, the tail feathers plucked, and had been left grounded for an unknown amount of time before an anonymous person discovered the bird and delivered it to the Navajo Nation Zoological Park. Immense efforts were undertaken to save the eagle’s life. Hawks Aloft volunteers Larry and Kim Rimer drove to Window Rock to pick up the eagle, transporting it to Gail Garber’s house in Albuquerque, then to Santa Fe, where Ty Horak and Nirankar Ambriz transported the eagle the last leg–to Cottonwood Rehab in Espanola and the care of Doctor Kathleen Ramsay. 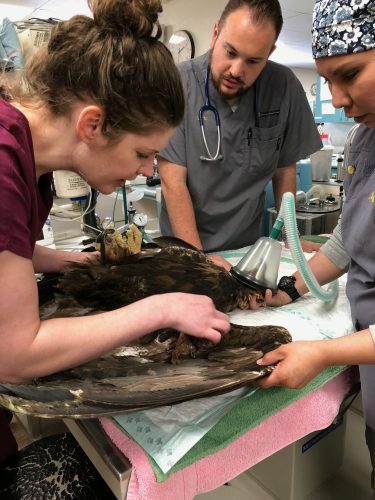 Though triage and surgery were quickly underway, existing infection from the birds injuries and hours on the ground eventually took this Bald Eagle’s life. Just a few days later, on March 21, another eagle arrived with a similar story to tell. The bird had been shot and its tail feathers removed. 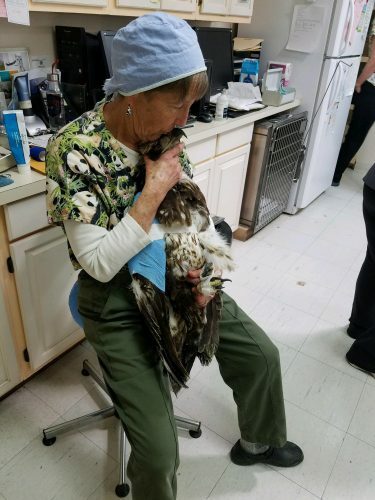 Arlette Miller, our Raptor Rescue Dispatcher, took the call from the Navajo National Zoo and immediately set out from Albuquerque to Window Rock, then bringing the bird, again, to Doctor Ramsay for an emergency surgery. It was determined over the course of this eagle’s lengthy recovery time that, although it could live happily in captivity, permanent injuries mean it will not be returned to the wild. 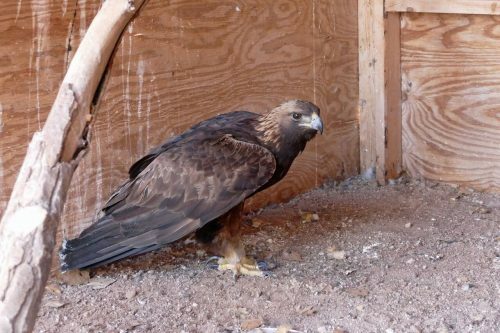 This adult male Golden Eagle will live out the remainder of his life at the Navajo Nation Eagle Sanctuary, educating visitors with his story. 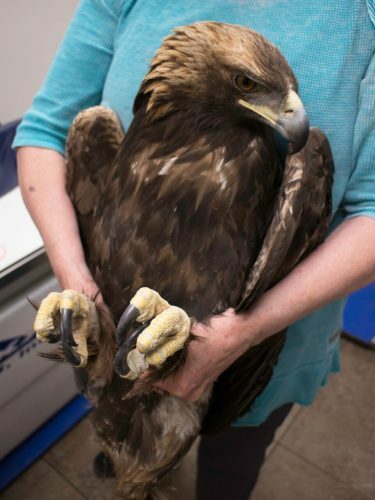 On March 30, yet another Golden Eagle was found in the same state as the first two. 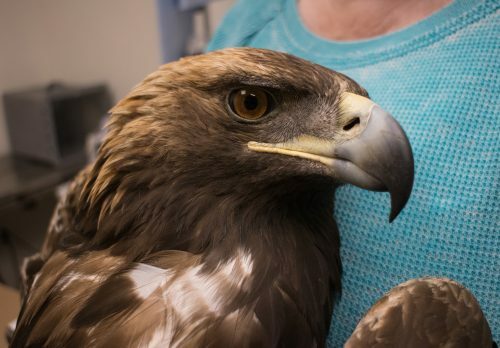 Discovered by a Navajo Agricultural Products Industry employee, this female Golden Eagle was quickly delivered to the Navajo Nation Zoo where emergency triage was performed. Chad Smith soon thereafter brought the bird to Albuquerque where Dr. Kariana Atkinson of Petroglyph Animal Hospital performed further triage and took X-rays. At first hopeful that this bird might be re-released post-surgery, Dr. Atkinson’s team performed surgery to repair the bird’s humerus bone. 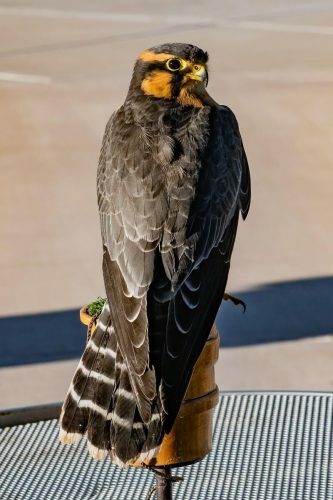 Over the course of recovery, however, it became apparent that this bird, too, must remain in captivity for the rest of her life under expert care at the Navajo National Eagle Sanctuary. Though under continued investigation by the US Fish and Wildlife Service and the Navajo Department of Game and Fish, the perpetrators have not yet been apprehended. In late July representatives from Hawks Aloft attended a press conference at the Navajo Nation Zoo in Window Rock to receive news of the birds. Gail Garber, below, reports on the conference. On Tuesday, July 31, 2018, Larry Rimer, Dr. Kathleen Ramsay, Lori Paras and I attended the press conference at the Navajo Nation Zoo in Window Rock. Below, I share comments from the Navajo Nation Department of Fish and Wildlife and also the US Fish and Wildlife Service. Golden Eagles, one of the most sacred birds to the Navajo People, have many threats to their survival on the Navajo Nation. They are threatened by climate change, drought, and excessive grazing, leading to low prey availability, disturbances to their nesting and hunting areas, lead poisoning, powerline electrocutions, vehicle strikes and other accidents. The Navajo Nation Department of Fish and Wildlife has been dealing another serious threat as well, illegal shooting for feathers. 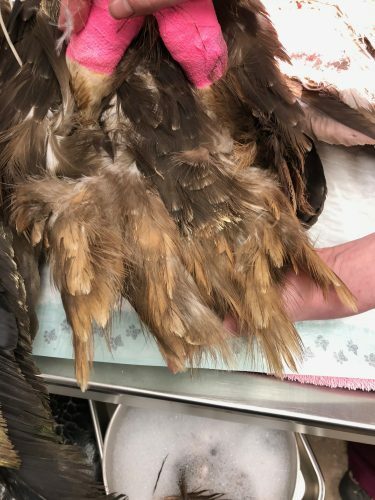 The most recent of these illegal acts occurred in March 2018, as the Department’s Wildlife Law Enforcement Program responded to numerous calls regarding eagles shot with their tail feathers removed. These heinous acts were conducted solely for financial benefit, going against federal laws, tribal code, and the spiritual sacredness of the Golden Eagle. Today, July 31, 2018, the Department is welcoming two of these Golden Eagles back to the Navajo Nation; unfortunately they both were severely injured from the gunshots and cannot be returned to the wild. 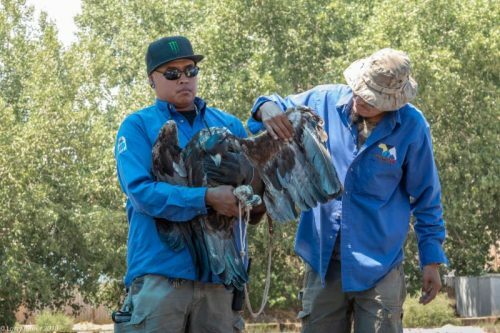 Both eagles will remain in captivity at the Navajo Nation Eagle Sanctuary and will be cared for by the expert staff of the Navajo Nation Zoo for the remainder of their lives. Although we are pleased to be able to provide a home for these two eagles with our federally-permitted Eagle Sanctuary, the Department is disgusted by the acts of this person(s) that shot these eagles and removed their tail feathers. All efforts are being made by the Department and the U.S. Fish and Wildlife Service to apprehend these violators. These rehabilitated eagles represent both the extreme cruelty and compassion of people. The Service is still investigating these crimes and hopes to see justice done. A reward is being offered for information in the case. We thank our partners, both those helping with the investigation and the rehabilitators who tended to these birds. We recognize the importance of eagles to our tribal partners and will continue to work through our tribal aviary program and National Eagle Repository to provide a legal source of feathers for cultural and religious needs. 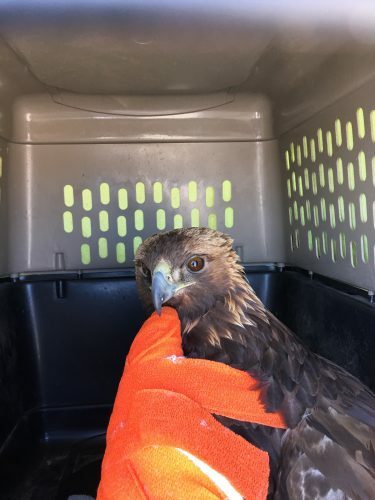 We, at Hawks Aloft, want to recognizes and thank all of the partners who helped in the care and transport of these birds: David Mikesic and his staff at the Navajo Nation Zoo. Dr. Kariana Atkinson and Dr. Ray Hudgell at Petroglyph Animal Hospital, Dr. Kathleen Ramsay at Cottonwood Rehabilitation, Lori Paras at Santa Fe Raptor Center, Larry and Kim Rimer, Arlette Miller, Katrina Hucks, James Robinson, Nirankar Ambriz, Ty Horak, and Lisa Morgan. Dr. Kathleen Ramsay holds the Bald Eagle as it wakes up from anesthesia. Imagine: As dawn began its faint ascent on the eastern horizon, the young Bald Eagle roused atop a power pole, yanking one leg and foot back up into the warmth of his breast feathers on this chilly morning. Soon, the prairie dogs that called the Navajo Agricultural Products (NAPI) fields would awake and the hungry eagle might find a meal. Suddenly, a loud pop reverberated and the eagle felt a blinding flash of pain in his left wing, falling to the ground in agony. As he lay there, not understanding the searing pain, two men hurried toward him. One held him down forcefully, and the other began pulling out his tail feathers one by one. Once finished, they left him there to die a slow death, no longer able to fly. Fact: March 16, 2018. 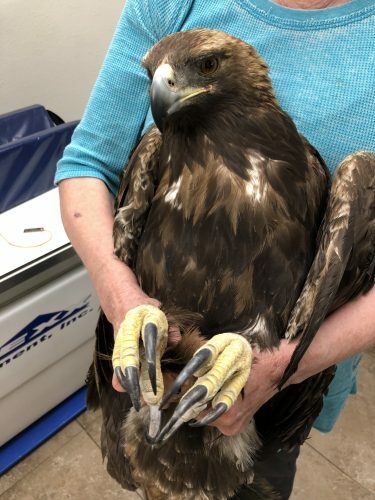 This eagle, found by an unknown person, was driven to the Navajo Nation Zoological Park (NNZP), in what would become the first raptor rescue call that day. David Mikesic, Director, called to ask for transport help to get the eagle here. Larry and Kim Rimer drove the 3-1/2 hours to Window Rock to pick up the injured eagle, returning him to my home, where we transferred his travel crate to my car for the drive to Santa Fe. His next trip was to Santa Fe to meet Ty Horak and Nirankar Ambriz, who drove him to his final destination: Cottonwood Rehab in Espanola. There, Kathleen Ramsay, DVM provided critical triage, and examined his fractured elbow. Surgery followed the next day and it appeared to be successful. However, the unknown length of time the eagle lay on the roadside, had caused a massive infection that later took his life. Juvenile Bald Eagle awaiting transport to Albuquerque. Imagine: A few days later, a Golden Eagle waited for dawn, hoping for an easy meal of prairie dog at the massive colony adjacent to NAPI. BOOM! All tail feathers pulled on each eagle. Fact: March 21, 2018. Another phone call from the NNZP, another shot eagle with tail feathers pulled. NNZP drove the bird to Albuquerque, where Arlette Miller, raptor rescue dispatcher, then drove the eagle to Espanola. Emergency surgery, again by Kathleen Ramsay, revealed the wingtip was already dead and would have to be removed. This adult Golden Eagle would have to spend the rest of his life in captivity, no longer able to fly. However; without his hunting prowess to feed his mate and nestlings, his 2018 nest certainly failed as his eggs/hatchlings would not be old enough to be left alone so the female could hunt. He is thriving under captive care and will eventually be returned to the NNZP, where his nightmare can be shared with their visitors. The male Golden Eagle in transport to Albuquerque. This was the second eagle shot. Imagine: A shot rang out at NAPI, pre-dawn, and the big female Golden Eagle fell from her power pole perch. Pain seared through her wing, while two men held her down and yanked out her tail feathers. Then, she was alone, in agony, unable to fly, and waiting to die. Golden Eagle #3, a female. Fact: March 30, 2018. Shot on NAPI fields, a NAPI staff member found the eagle. Chad Smith picked the bird up and drove it to NNZP arriving at 10 pm, where he and David Mikesic administered triage. Chad then drove her to Albuquerque, on March 31, 2018 and transferred her to Arlette Miller who took her to Petroglyph Animal Hospital where Dr. Kariana Atkinson performed triage and took X-rays. April 2, 2018. Dr. Kari and her colleagues, Dr. Ray Hudgell and Dr. Mike Melloy, performed surgery to repair the humerus bone, inserting many pins and an external fixator device that will hold everything in place while the bone heals. There is optimism that she might be releasable, but it will be months before releasability can be determined and for her tail feathers to regrow if the feather follicles have not been damaged. 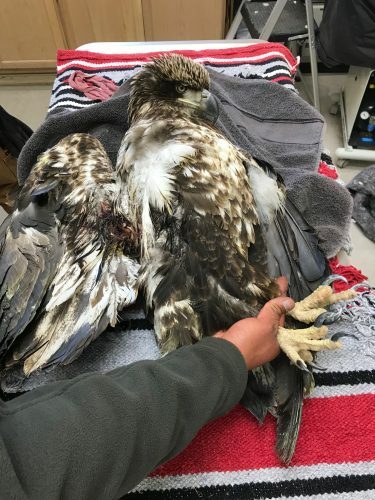 Both the US Fish and Wildlife and the Navajo Department of Game and Fish are investigating and rewards are offered for information leading to the arrest of the perpetrator. 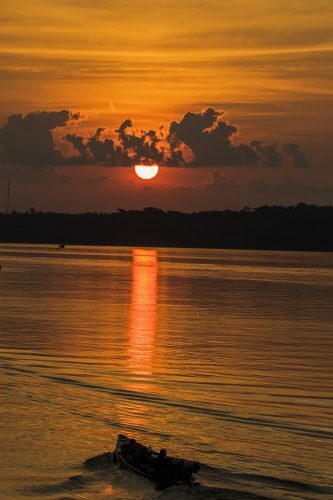 Sunset on the Maranon River, Peru. Image by Edison Buenano. Water, water, everywhere! Our group of 17 called the La Perla riverboat home for 8 days, venturing out in large skiffs to explore the black water tributaries of the Marañon and Yucialli rivers, themselves tributaries of the might Amazon. 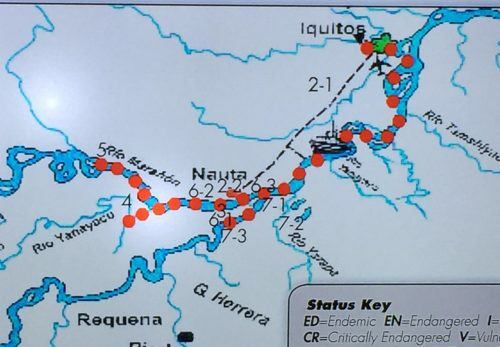 This trip was scheduled during the rainy season, when the rivers are in flood stage, facilitating access via boat to areas that would otherwise be impossible to reach during the much hotter dry season. Many of us were worried, needlessly, about the copious downpours featured in movies, but only one gentle shower graced our stay for about two hours. Diversity was the norm on this adventure focusing not just on birds, but all wildlife as well as native customs. One of our group’s boats on the Amazon River. Image by Gail Garber. One skiff was dedicated to birding and the other to photography. 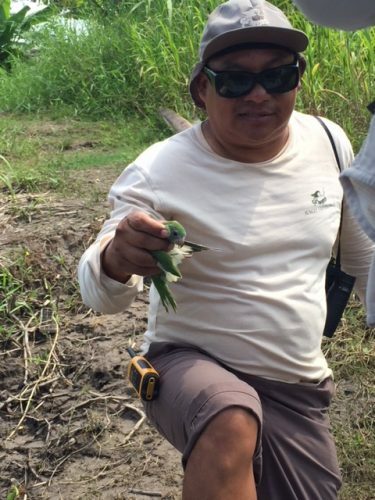 Of course, my choice was the birding skiff, where Edison Buenaño was our guide. 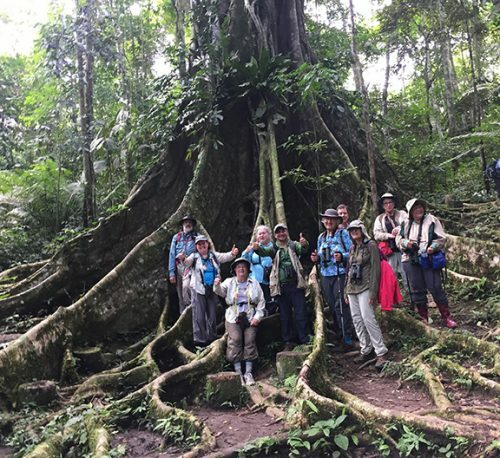 Birding the tropics seems to always be a challenge due to the huge number of species and the unfamiliar calls, but Edison, native to Ecuador and one of the premier guides in South America, knew each and every vocalization. It was his excellent ear that lead us to see some very unusual birds, like the Hoatzin, a very rare bird indeed. 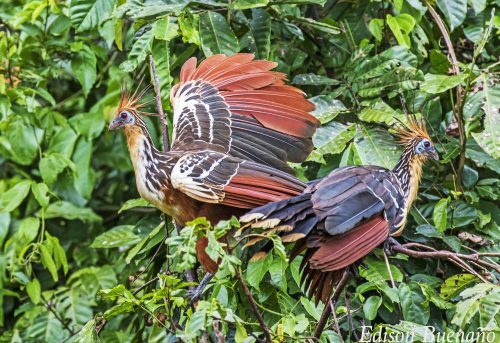 Hoatzin, Image by Edison Buenano. In all, we tallied about 300 different species, depending on the choice of boat and whether you were looking in the right direction at the right time. 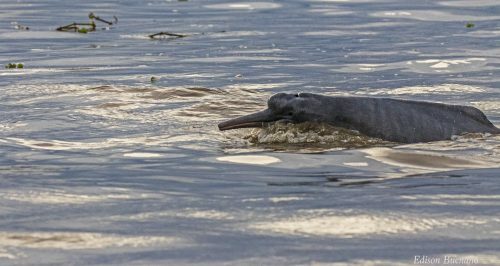 The Amazon and its tributaries are home to freshwater dolphins, including the Amazon River dolphin or Boto, a freshwater dolphin found in the Amazon and Orinoco Rivers of South Amercia. It is the largest river dolphin species in the world and comes in pink and gray. One afternoon, there was an apparent feeding frenzy near the boat that yielded great looks at both pink and gray dolphins. 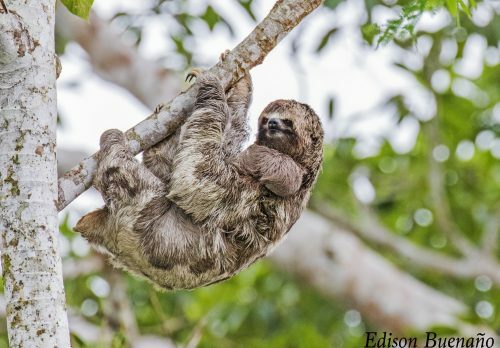 There were numerous sightings of Three-toed Sloths with young, and many species of monkey. Pink River Dolphin. Image by Edison Buenano. Brown-throated Three-toed Sloth and Baby. Image by Edison Buenano. One of the highlights was visiting the local villages where we were treated to a traditional meal before visiting the school. We had brought school supplies to share and some soccer balls too! The kids regaled us with songs and asked us to sing back to them which caught all of us adult Americans off-guard as we were not expecting that. We all looked at each other dumbfounded; then one of us began singing Old MacDonald Had a Farm. We all chimed with a “Moo Moo Here and Moo Moo There – EIEIO!” Luckily there are no recordings of that! 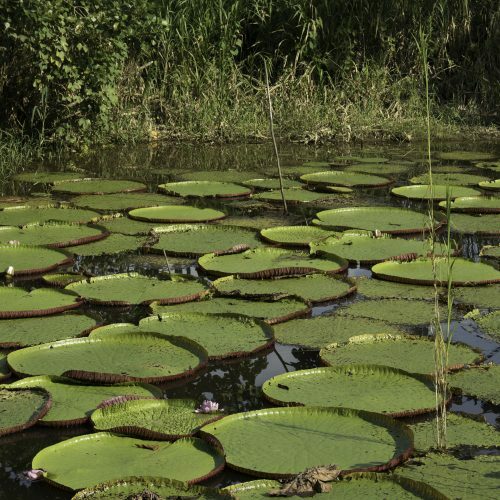 The pond at the next village was chock full of the giant Amazon Victoria Lilies, complete with a Wattled Jacana family where parents and chicks were comfortably walking atop the lily pads with a spread of six or more feet. Victoria Lilies. Image by Gail Garber. We also watched an artist creating fibers from the slender leaves of native plants and then using native plants to dye the strands in bright orange and yellows! 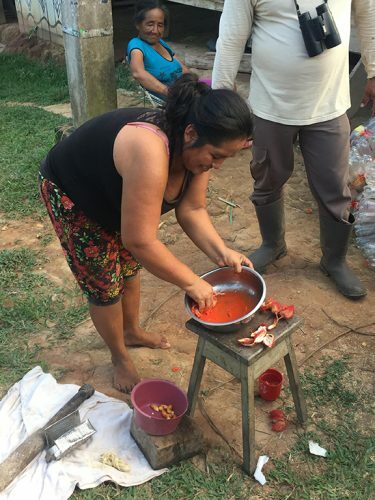 We visited the area Shaman who shared her knowledge of natural medicines and blessed our group in a ritual ceremony. 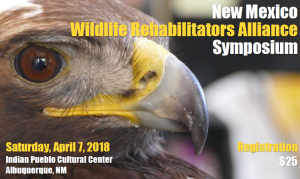 Kathleen Ramsay and her son, Ty Horak were among the participants; some of you might know her as “Doc”, the wildlife veterinarian that has cared for some of the most difficult rehabilitation cases in New Mexico. On two different occasions, kingfishers collided with the La Perla windows, only to be rescued, revived and later released alive and well. The morning cacophony was mostly dominated by seemingly endless large flocks of White-winged Parakeets traveling from their roosts to begin foraging. 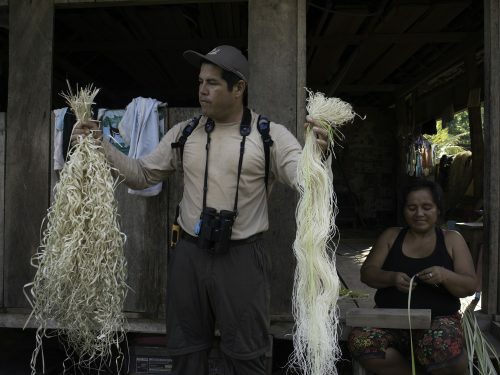 One day, our astute local guide, Victor Ramirez Arevalo spotted a White-winged Parakeet trapped in a fishing net that had been hung out to dry. While we anxiously cooled our heels on the skiff, he approached the local villagers to ask permission to release the little guy/gal. Soon, he was stepping back aboard the skiff with a very stressed and overheated parakeet. This time, it was my privilege to loosely hold the bird in Sami Sanborn’s neckerchief, while Bruce Stone dabbed water on the cloth to aid in cooling the bird. We released the parakeet not far away, but safely away from the fishing net. And, so it went, with first on new lifer and then another, and monkey antics galore. Victor Rescues the Trapped White-winged Parakeet. Image by Joan Grissing. 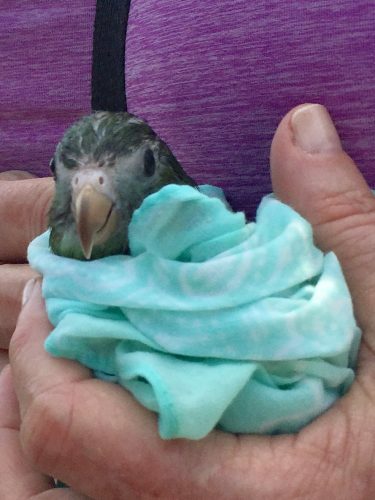 White-winged Parakeet, feeling better and ready for release. Image by Joan Grissing. While all meals on the La Perla were outstanding, the evenings were the best, when the staff morphed into “The Chunky Monkeys”, regaling us with local tunes and even dancing! What could be better! Map of Area Our Group Visited. Our final quest was the Humboldt Penguin, along the coast. Pucusana, an hour south of Lima, was our destination, where a rickety boat with a small motor awaited. The abundant and beautiful Inca Terns a rickety boat to motor around a very large land formations, the territory of seabirds of all kinds. The ocean swells were enormous and the little boat floundered along until we reached a cliff tucked back in among a deep cleft in the massive cliff. 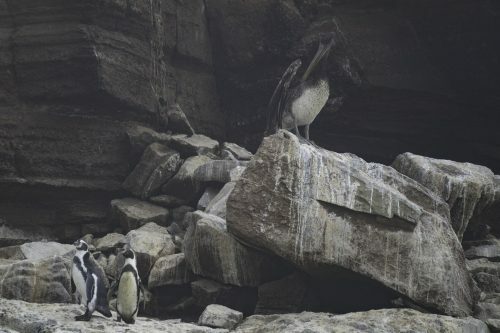 As the tiny boat rose and fell with the roiling swells and appeared to be drifting right toward the rocks, the penguins appeared under the shelter of an overhang. We definitely earned that particular species! About half of the group returned home that night while others traveled on to Machu Picchu and other far flung sites. It was yet another Hawks Aloft Grand Adventure! I hope you will join us in Guatemala in January 2019! The wildfires that recently raged in California’s North Bay have renewed concerns about the dangers and effects of forest fire across the West. After dealing with the immediate concerns—that the fire spread so uncontrollably and killed several dozen people and destroyed thousands of homes, businesses, and other developed spaces, many began to wonder about the less apparent effects, for example—what happens to wildlife during these events? Hawks Aloft supporters might be wondering in particular—what happens to birds during forest fires? Forest fires aren’t necessarily unnatural or bad. In fact, over millennia, many species have evolved to cope with fire where it is a natural part of the landscape. In fact, some organisms, like morel mushrooms, for example, only produce spores when stimulated by the heat of fire. Additionally, certain plants only seed in the aftermath of events such as these and young aspen trees thrive in the nutrient rich soil post-burn. 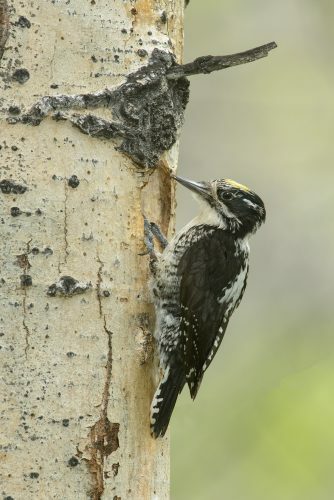 Some birds benefit tremendously—take, for example, species of woodpecker, who when new habitats are formed in the wake of forest fire, swoop in and feast on bark beetles exposed in dying trees. Species like these actually benefit as a result of wildfire. Yet, October’s fires in California were caused by human activity, not natural events such as lightning. And with a rising global temperature, fire season is lasting longer, and individual fires are blazing for extended periods of time. When massive fires such as these attack landscapes where natural fire activity has long been suppressed, the impacts can be more far-reaching. Generally speaking, birds fly away, mammals run, and amphibians and other small animals burrow into the ground or hide in logs or under rocks. Young, weak animals, and nestling birds (during certain times of the year, of course) are the losers in these scenarios, because they are unable to flee to safety. Despite these inevitable casualties, usually direct mortality to avian life isn’t very broad or devastating during forest fires. What can negatively impact bird populations in areas of forest fire are things like air quality. Birds are circular breathers, so smoke from fires can damage their delicate respiratory systems. However, impacts like these haven’t been widely studied on bird populations, so it is difficult to gauge the number of birds who might have succumbed to these peripheral effects. For example, during a 1999 fire in the Everglades, smoke is thought to have contributed to the deaths of 50 adult White Ibises, and low-flying birds, by some accounts, suffer even more. In New Mexico, Hawks Aloft has spent five years monitoring birds in the Jemez, gauging various species responses to fire, and the habitats created in their aftermath. So far, what we have come to understand is that responses vary considerably across the 112 species documented there. 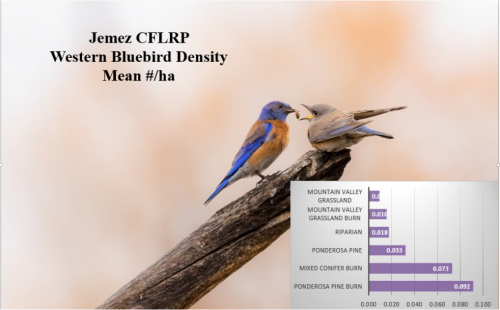 Species of concern, like the Grace’s Warbler were far less present in burned habitat than unburned, while species like the Western Bluebird seemed to thrive in burned landscapes. A sample of information gleaned from our studies is pictured below. Every forest fire is different in its breadth and reach, and each habitat is different. It will take time and deliberate study to understand the impacts of California’s fires on the bird life there. As always and as a testament to the resilience of nature, some species will be hurt and some will thrive after this widespread blaze. What is assured, that given time, the forest will rebound and the habitat there will, once again, transform. 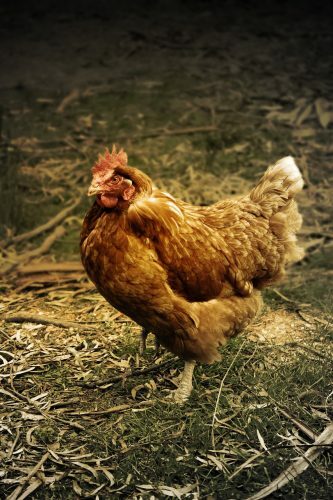 You may have heard a lot about avian influenza (AKA avian flu or bird flu) a lot in the news lately—and it probably sounded quite scary! In an effort to assuage some of the mounting fear on the topic, we thought we’d explore what avian flu is, how it is spread, and how it behaves in the human, as well as the bird body. While avian flu has had an impact across the globe, in actuality, its effects have remained minimal. So, what is the deal with avian flu? And who does it effect? Avian flu is a highly pathogenic disease (dubbed H5N1, with variations on the disease being numbered H5N2-9), which is quite common in wild birds. Many birds carry the virus in their intestines, but it does not make them sick or impede a heathy life in any way. Despite its mostly innocuous behavior, it is highly contagious among most birds (and across species). 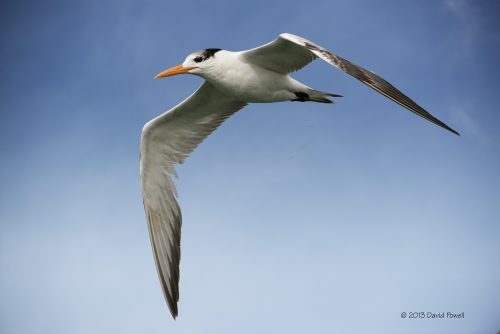 Researchers have been studying the way it is transferred and how wild bird bodies process and adapt to the disease since it was first isolated from terns in South Africa in 1961. Birds transfer the virus between one another through saliva, nasal secretions, and feces. As mentioned above, generally, this doesn’t cause any problems, at least until the virus comes in contact with a domesticated species of birds, which includes chicken, duck, and turkey—all of which human beings like to eat. Outbreaks among poultry, in turn, put people at risk of becoming sick. 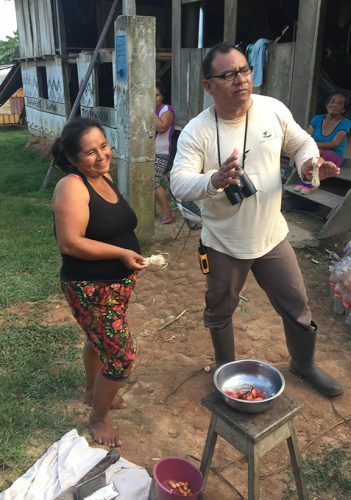 The effects in human beings vary depending on the strain—but people can’t catch the disease from wild birds, only from handling infected poultry. Symptoms in human beings include fever, cough, sore throat, muscle aches, eye infections, and respiratory diseases. In recent months, there have been outbreaks of avian flu in China, Taiwan, Belgium, South Africa, and the U.S., though in these instances, not every outbreak has led to sickness in humans. In fact, despite widespread concern, last year only one death from avian flu was recorded in the United States—the result of infection contracted at a turkey farm in Indiana. The disease isn’t easy for humans to contract, thankfully, and it is difficult for humans to pass amongst each other. Since the avian flu is mostly relegated to domestic, farmed birds, it shouldn’t impede any of your birdwatching or appreciating in the slightest! Wild birds, resilient as ever, don’t suffer with avian flu in the way that other species do. Another reason to watch in wonder as they pass by overhead! 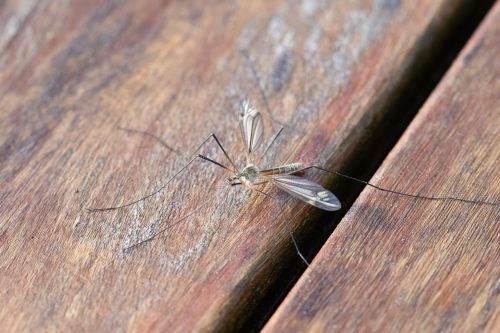 Mosquitoes can breed in just a couple of tablespoons of water, which is why the gallons of water standing in the bosque are a little troubling when it comes to management of the pests. This year, heavy snowpack, coupled with early warming (before a late cold snap) caused the river to rise higher sooner and stay longer, causing flooding in the bosque. All these forces combined to create a perfect breeding ground for mosquitoes, bolstering their numbers considerably, and causing a concern for the city as early in the year as April. Since mosquitoes can go from egg to adult in a week, it is high time to start thinking about what we all can do to mitigate the concerns created by an increased mosquito population. At Hawks Aloft, West Nile Virus (WNV) is now at the front of our minds. West Nile Virus was first detected in New Mexico in 2003. This, of course causes concern for humans—there were six confirmed cases of the virus in New Mexico last year, one of which resulted in death. It is also a concern for horses, who can be killed when infected, and dogs, in whom it can cause heartworm. And, it is also a very serious concern for avian populations. The last time mosquito populations boomed in our state, local Cooper’s Hawk and crow populations were devastated by an outbreak of the disease. In birds, the mosquito-born pathogen creates a rapid, traumatic response, resulting in death rather quickly. Taken with the many other threats to birds—like cats, pesticide use, and habitat loss—WNV contributes to a huge overall decline across species throughout the entirety of the U.S. For example, a study released in 2015 indicated that Warbling Vireo populations had been reduced a full one-third solely due to WNV (killing 15 million of the 49 million total population). This strong impact on certain bird populations is related to the fact that the virus multiplies more quickly in an avian host than in, say, a mammal. Over 300 species of birds have been found infected with WNV, which is very troubling considering the very high rate of mortality among them once infected. Hawks Aloft has been directly affected by the spread of this disease. 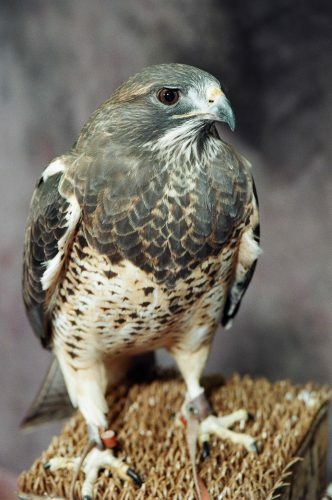 One year, Aires, a Swainson’s Hawk that came to us in the mid-90’s after being hit by a car in Raton, was found listless on the floor of her mew. Panicked, her caretaker rushed her to Petroglyph Animal Hospital, where she was treated for WNV, spending considerable time in an oxygenated incubator hooked up to a continuous fluid drip until the virus ran its course. Had she not been treated so promptly, the disease might have caused a plethora of awful symptoms including ataxia, weakness, tremors, loss of flight, blindness, rapid weight loss, and in its final stages, severe seizures. Aires recovered and is happy and healthy today, but many birds are not as lucky. This year, anticipating the boom in pathogen-carrying mosquitoes, we have committed to vaccinating every single one of our beloved Avian Ambassadors against the virus—that’s 25 birds in total!—so that they will never know the suffering caused by this disease. The conservation work that these birds help us to do is invaluable, and we want to protect their health and safety at any cost, although it is an overwhelming financial burden. The total cost of the vaccinations is around $1,700, straining the budget of our small nonprofit. 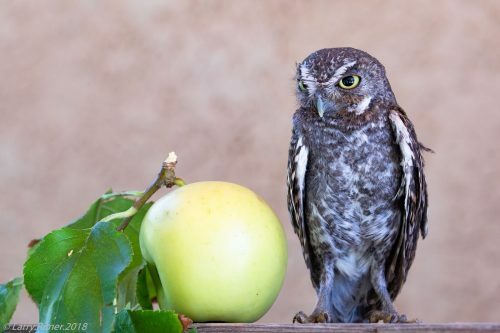 You can help us to protect our Avian Ambassadors—including many species from a small Saw-whet Owl to large Red-tailed Hawks, and even one American Crow—by making a donation in any amount you are able. Helping us protect our birds means helping to protect birds everywhere by allowing us to continue educating our community about the importance of avian life. Thank you for helping us to continue our mission and for sustaining our Avian Ambassadors through these hard times.